Health and Safety is paramount to Tong Peal in the manufacturing of all machinery. CE marking is clearly shown on each machine meaning the customer can buy Tong Peal with confidence. 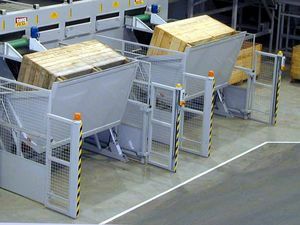 Light guards are a standard feature on box tippers (not fitted when box platforms is more than 1800 mm high) and should not be compared with a normal sensor and reflector. when box is placed into the tipper cradle it is detected by a switch. A timer begins and after a few seconds the tipper cradle beings to lift and the light guards become 'active'. Thereafter any breaking of the security beams at the entrance to the tipper the machine will stop. It can only be restarted by the 'reset' key. Two sensors in the machine ensure the correct automatic operation. If the guards are not broken 'unnaturally' then the tipper works even though the forklift constantly passes through the beams. The light guard system is a foolproof, self monitoring system which constantly checks that hte safety system is operating correctly. This cannot be said for a simple sensor and reflector system. This system whilst cheap does not meet EC legistlation. The Tong Peal light guards do meet EC legislation and so our machines are correctly CE marked.